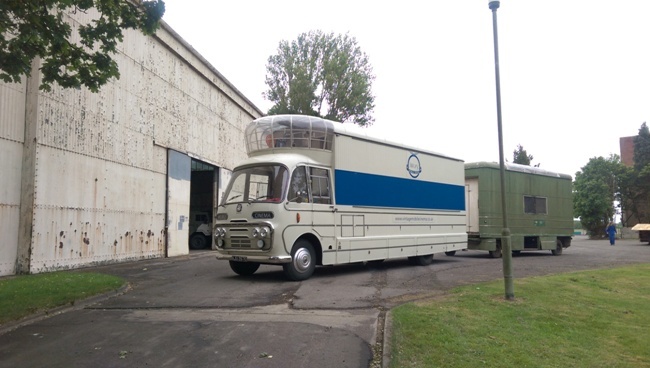 In the early 1960’s the Government researched the idea of a mobile cinema that could travel around to engineering firms and giving training sessions on how they could improve industrial productivity. 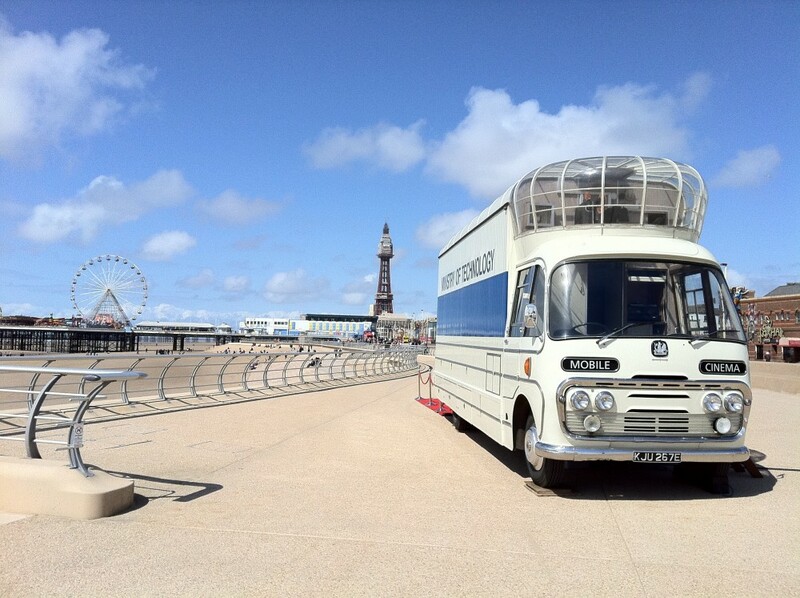 A prototype Mobile Cinema was created and by 1964 this was visiting engineering firms and giving training sessions. Any problems and issues were ironed out during this phase before the Government invested a further £1,000,000 in moving the scheme forward and creating the final units. 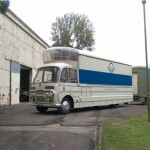 In 1967, The Ministry of Technology built seven of these custom mobile cinema units to tour the country, promoting modern production techniques to British industry. The seven Bedfords were operated by PERA (Production Engineering Research Association). 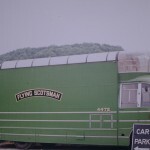 Films would be played within the cinema, with supporting displays shown in the trailer that accompanied the towing unit as they toured the nation’s factories. 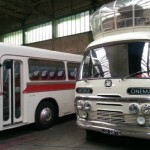 The Bedford SB chassis was fitted with coachwork by Coventry Steel Caravans (CSC), utilising cabs supplied by Plaxtons (hence their similarity to Plaxton-bodied coaches that used to be common throughout the 1970s). 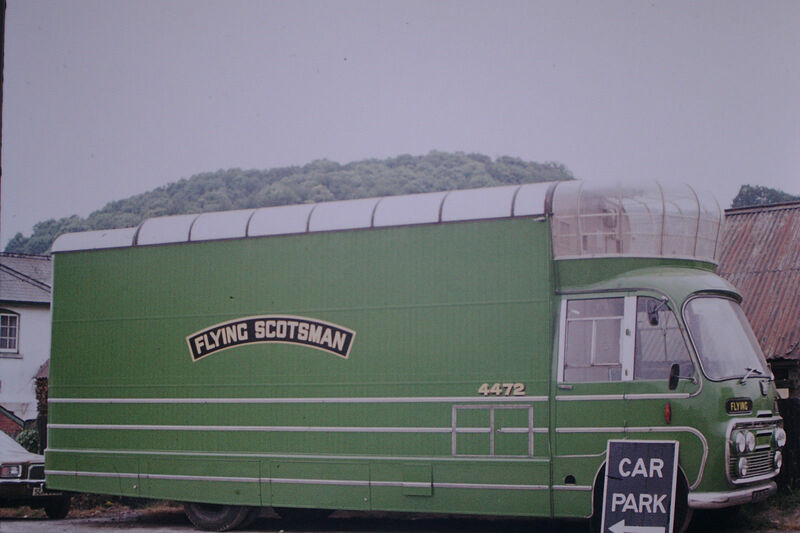 The remote control projection equipment was placed in the steel framed, perspex-glazed dome above the cab. CSC also built the towable display trailers. In 1974 the Government sold off the mobile cinemas, and this one is the sole survivor as far as is known. KJU was purchased from the auction to accompany the re-patriated Flying Scotsman steam locomotive, but was donated shortly afterwards to the Transport Trust. They owned it for a further 15 years before selling it on to Peter Rawlings of Essex in November 1990. M.G.M Haulage of Bedford mobile cinema KJU 267E, October 2003. Despite best intentions the unit then didn’t see the road again until October 2003 when it was rescued from a field by Rob Howell and Nancy-Rose Mills, minus the 4 speed Turner gearbox (and gearstick) stolen from it. The Bedford 300 petrol engine had also seized in this time, meaning the only way to recover it to its new home in Somerset was by means of HGV low load – the first of several times Malcom Millard (M.G.M Haulage, Southampton) moved the cinema unit. 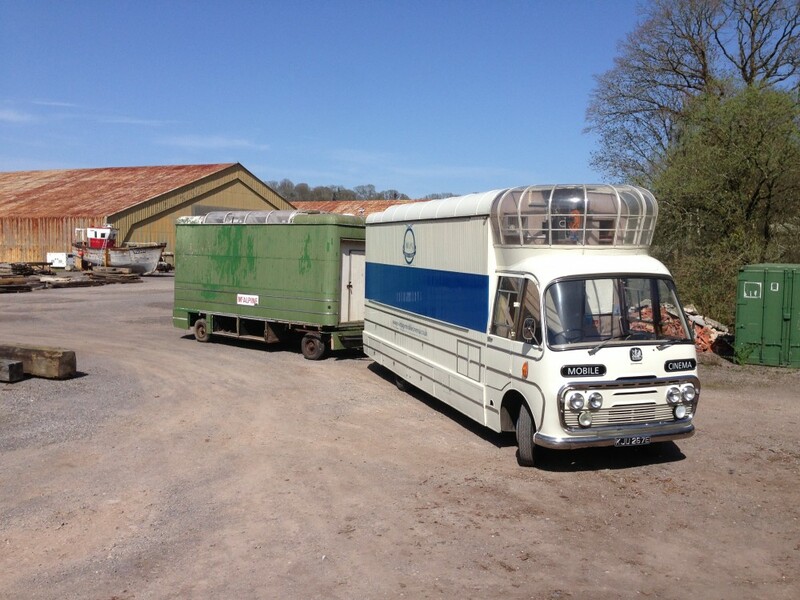 Not long after, in March 2005, Rob and Nancy had realised the scale of the project to restore the mobile cinema was too great for a young family and so sold it to Oliver Halls, of Devon who lovingly restored the vehicle but not without several years passing and some lengthy delays. The vehicle now has a Bedford 330 diesel engine fitted (taken from a Bedford TL) with a 5 speed Turner box, restored brakes, now upgraded to air over hydraulic and emerged in the spring of 2010 ready for service once more! Ollie ran the cinema to festivals and events from 2010 until 2015 however with the appearance of young children and family commitments he reduced the number of bookings that he accepted. In 2015, there was a potential sighting of one of the original Cinema trailers – it had been many decades since our trailer had last been seen. On visiting a farm in Sussex, it turned out to be the exact same trailer as our Mobile Cinema with the same registration (KJU267E). The farmer was using the trailer as a workshop for doing carpentry. 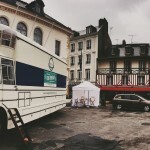 He very kindly sold the trailer back and the mobile cinema and trailer were re-connected again for the first time in 40 years. 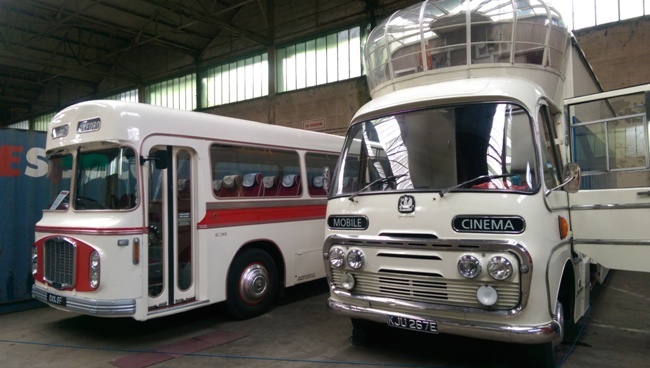 Since 2015, the mobile cinema is now owned by Ben Moorhouse and lives at Bicester Heritage. The perfect environment where she is stored along with many other vintage vehicles and surrounded by craftsmen and lovers of all things historic. She is also perfectly placed geographically to continue to take bookings around the UK. 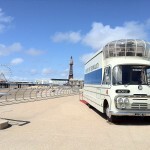 The Vintage Mobile Cinema has had a lot of profile over the last few years including a number of TV appearances. The most noteable was the George Clarke Amazing Spaces Show. The 5 minute appearance in the 2nd series includes a feature in the book connected with the series.